In the past, my mid-year and year-end updates used to be a few weeks late. Now, the mid-year update has run into the year-end one and together, they have spilled into the new year. If I keep this up, you will be getting year-old news in the near future. However, a certain friend (you know who you are) has been cracking the whip to get me to maintain a journal or a blog. So I hope to rectify this deficiency in the coming months. We had our sugarcane harvest and jaggery making season in February. We planted our next crop of sugarcane in March. The jaggery has been very well received by the people who have bought from us. Our dog Veeru (Veerappan) met with a sticky end. Since then, we've taken in another abandoned puppy Ozzy (Osama) who now has the enormous responsibility of inducing terror in the hearts of the local stray cattle and random people that happen to wander onto our farm. He has been an utter failure thus far. Our cow Gowri gave birth to a male calf in July.This was the 5th calving on our farm and all 5 have unfortunately been males! What are the chances of that? We have completed all the construction activity that has been dragging on for the past 2 years. The cottage for our farm-stay visitors is ready and we have hosted our first paying farm-stay guests. Visitors will no more have to spread the mat on the floor and grin and bear it, when they visit us. At the start of the monsoon, we completed planting the cashew nut orchard and the mango orchard. Also planted several mahogany and jackfruit trees as part of our retirement planning (good timber). Our poultry population has increased and we have a busy time searching out the eggs from all the new hiding places that the hens lay them in. Our organic product list now boasts of rice, jaggery, banana, arecanut, elephant yam, free ranging country eggs, milk and milk products (ghee, paneer, butter). We have started selling our produce in Bangalore for the first time, among friends and friends-of-friends. The response has been encouraging. The final significant news item is that the IT industry no longer bankrolls my farming misadventures. I had quit my corporate IT job early in the year and have joined Sushie as a full time farmer and home maker, trying to make a living from our farm. I'm hoping to devote more time to writing too. The long story now - It has been an eventful first half of the year for us, both on the farm and off it. During December-January, we finished our arecanut harvest and processing. Prices have been fluctuating a great deal and deciding when to sell the produce was like timing the stock market. We couldn't take the risk of hanging on to it for too long, lest it starts spoiling from bad storage. We finally sold it at a fairly bad price. We are still learning about the maintenance required for arecanut trees. Our reluctance to use chemical sprays and follow other environmentally destructive local practices like topping up the soil every few years with new topsoil taken from the forests around us, has made things a bit harder. So we'll just have to live with what we get. The sugarcane harvest and jaggery making season was in February. This activity is called aalé mané locally and is a fairly exciting event. We booked our turn for the sugarcane crusher and the jaggery making equipment. In the past few years, we had to cart our harvested sugarcane further out to another farmer's field. This year was much easier since we had the equipment brought over to our neighbouring field. Our friend Rajan and cousin Prashant visited us around this time and were able to give us a hand with the harvest. (They promised to return next year too.... so I presume they enjoyed it.) There is also a tradition of inviting all the neighbours for this event and everyone comes with containers and bottles to take home sugarcane juice in. The belief is that the more juice you give away to people, the better will be the quality and quantity of your jaggery. I've heard stories about some farmer who turned away people who had come to drink sugarcane juice and that year his jaggery got all burnt. What is essentially an act of hospitality in the local culture gets further enforced with these stories. When we harvest our sugarcane, we only cut it at ground level. The stem below the ground puts out new shoots which then forms our next crop. This method is called ratooning. This saves us a lot of effort in replanting and the crop also establishes faster. Last year's crop was planted too far apart. So this year, we ratooned that crop and also planted fresh intermediate rows. When the new addition to our family was imminent, we had to move to Bangalore to be closer to 'reliable' medical facilities. Since we were going to be away for about 4 months, the search for a resident caretaker on the farm, which had been fairly lukewarm for the past year, was suddenly intensified. We left word with our local contacts and a few potential candidates were given a tour of the kingdom. One wanted to move in that very day, since he had eloped and married a girl from his village and they didn't have a place to live. One decided not to join because his wife fell ill the day he visited our farm and he took that as a bad omen. It was lucky she didn't fall ill when he was at the market or the bank. Another one was given a generous pay hike and various other enticements to keep him from leaving his current employment. We finally landed up with this young chap and his wife and a 2 year old daughter. He seemed quite enthusiastic about the new assignment and it also gave him an escape from home where his wife wasn't getting along too well with the mother-in-law. That might've accounted for half the enthusiasm. Anyway, I brought them over, with their bed and belongings, the day before we left for Bangalore. After a quick tour of the farm and a hurried description of their duties, they were allowed to settle down. But seeing the new worker-couple join our place, our existing farm worker Ravi decided to look for greener pastures and dropped a bombshell that he wanted to quit. I rushed back to the farm 3 days later and the new couple seemed to have settled in nicely. After some hectic negotiations that culminated in a steep pay rise and also dangling carrots of various hues and shapes, the disgruntled worker changed his mind about leaving. Ruffled feathers were smoothened. The new worker was given his list of tasks for the week and surprisingly, he still seemed enthusiastic. I returned to Bangalore a happy man. 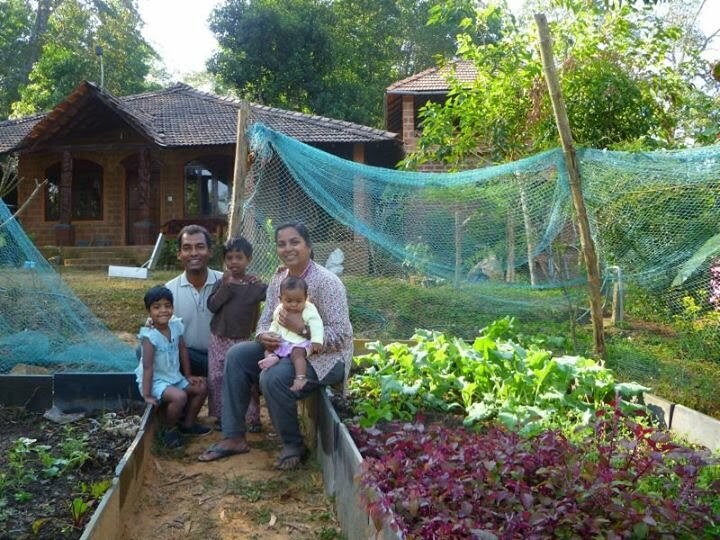 No sooner than I had arrived in Bangalore, I got a call from the farm saying that the family was packing up to leave. He had even taken an advance from me while hatching his devious plan to flee the moment I left. So we were worse off than when we started - we still had our two workers and one of them just had a nice pay hike. To make things fair, we made a comparable hike in the lady's wages too. The new wage package seems to have worked wonders. There is newfound enthusiasm in his attitude and work is moving along at a faster pace. That was money well spent. The other significant change in our lives was that I quit my IT job with Motorola and thereby severed the umbilical cord with the corporate world. Fifteen years in the industry had provided me with many wonderful opportunities to see the world and meet all kinds of people. Many of you are friends I've met on that journey. The time had come to close shop and try something different. I certainly miss the paycheck and the opportunity to travel but the sense of freedom that has come with leaving the industry, is priceless. No more late night conference calls and a Monday-Friday routine that was tolerable because of the weekend that came along. I get to spend more time with the kids and also potter around the farm a lot more. We've had a significant increase in our poultry population this year and had several successful hatchings of large broods of chicks. One of our largest broods had 14 lovely little chicks. The mother hen was aggressively protective of her chicks. We had made an enclosure with old fishing net in our front yard, for the mother hen and chicks to graze during the day. That way, we could keep an eye on them and ensure their safety. A few weeks earlier, when a Spectacled Cobra started hanging around the house, it was once seen near this chicken enclosure. (See pictures/video of the cobra encounter). When the cobra was packed off, we thought that the worst was behind us. The chicks were now over a month old and growing really well. There were some lovely coloured ones in the flock. We were away in Bangalore for over a week, for Good Friday and Easter. When we arrived returned, some horrible news awaited us. The previous evening, a dog from the neighbourhood had come there and it got into the chicken enclosure by tearing the fishing net. It then went about systematically killing the chickens one by one. He didn't even pause to eat the ones he had killed. When Ravi our farm worker heard the commotion and came running over, the dog had just about caught the mother hen too. He managed to chase the dog away. But the damage was already done. We were a dozen chicks short on the rolls. We have been without a dog for the past couple of months and that had emboldened other dogs and cats to wander around our place freely. Our delayed return to the farm provided the murderous dog an opportune evening to carry out the massacre. Ironically, that dog was born on our farm to Frisky, one of our previous dogs. We have since then, built a more secure home for the chicken. When daylight fades and the chicken have retired to their shed, a prison-like routine is followed, which includes taking a headcount and then shutting them in until the next morning. Some rebels and freedom lovers roost in the tamarind tree behind the shed, to evade being locked up. Our guest cottage was finally ready late in the year. We hosted our first paying farmstay guests during the last few days of the year. Two families, each with 2 kids, stayed with us for 3 nights. We had a great time hosting them and it seemed like they enjoyed their stay too. The kids had a great time splashing around in the stream. Camping in a tent was a new experience for them and the campfire on New Year's eve was the topping to the experience. We're hoping to have more visitors this year, which will give us an opportunity to meet new people too. We had a small crop of Elephant Yam that had to be harvested in a hurry to rescue it from a wild boar that had developed a taste for it. He had wiped out 10% of our crop in one frenzied night's feast. We still struggle to protect out crop from the wild animals around. Monkeys have ravaged our banana and cardamom plants and one bold langur has even been hanging around the house, eating our hibiscus flowers and drumstick tree leaves. I should make sure the kids are chained to something sturdy or fitted with GPS devices, lest the monkeys take off with one of them. I had bought some loud firecrackers during Diwali, to scare the monkeys away. It worked the first few times. Now, they just sit at a safe distance and enjoy the fireworks display I put up for them. They have raided our sugarcane crop a few times and I finally bought old fishing net and built a high fence around the field. That has deterred them to a great extent. Our neighbour's sugarcane crop was completely wiped out over a 3-4 day period by a wild boar. It was heartbreaking to see a whole year's effort get wiped out right at the end when we were so close to the harvest. We're hoping that our flimsy net will dissuade the wild boar from raiding our crop for another couple of weeks, before we harvest it and make our jaggery. Our dairy operations have been happening on a small scale. We have almost stopped selling our surplus milk and have been making paneer (cottage cheese) and ghee (clarified butter) which can be stored for longer and also fetch a better price. We are also about to start building our gobar gas plant and hope to meet all our cooking energy needs through gobar gas and our solar cooker. Many things have been planned for the new year. We're hoping the farm-stay activity picks up this year and we're hoping our fruit trees will start yielding too. Hoping to plant a turmeric crop and plant more pepper. There's a chance that Ravi our farmhand will get married this summer. (He's been threatening to get married for the past couple of years) If that does happen, he'll be off work for a couple of months or longer. It will be like flying a 747 on a single engine. We'll have to glide along for a while. Hopefully he'll come back with an extra pair of hands to help with the farm work.